Quick! What is more comforting and welcome than summer rain? That’s easy! A home at Summer Rain Private Estate – the new upmarket development north of Karino Lifestyle Estate, just 10 km from Nelspruit’s CBD. In fact, everything’s easy at Summer Rain… easy to afford, easy to access by taxi and bus, easy to meet great neighbours, and easily the best views around! Buying a home is a huge step. We’ll turn it into a few easy steps. Buying a house must rank as one of the biggest and sometimes most difficult decisions you will make. Fear not! We’re here to make it a bit easier. Our estate agents have learned a lot along the way, and we’ll use what we know to make this big change in your life a painless (even enjoyable) experience. You understand your own needs best. You have a good idea of what your ideal home should be like. Now you must determine what you can afford. Knowing your price range will help you focus your search. Once you’ve found your dream home (hopefully at Summer Rain! ), it’s time to get the paperwork done. But don’t worry – you’re in very capable hands. 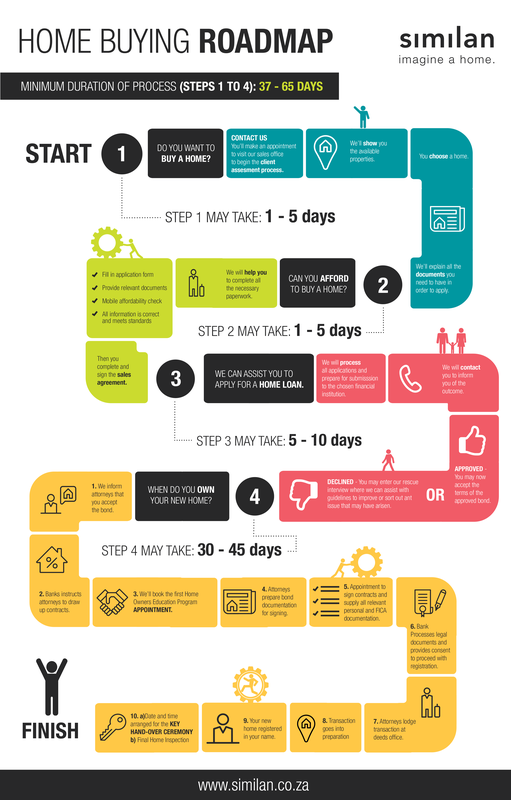 As you can see in the home buying infographic below, the home buying process can take as long as 65 days, and we’ll keep you up to date every step of the way! 4. registering the home in your name.